Where can I find information about the Universal Declaration of Human Rights? - Ask DAG! 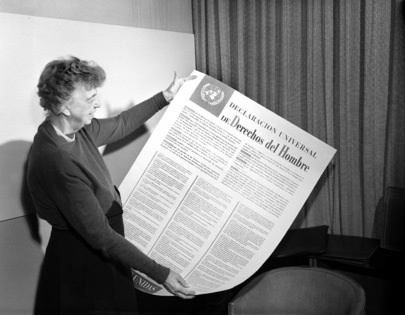 Where can I find information about the Universal Declaration of Human Rights? Where can I find the drafting history of the UDHR? Who was involved in the drafting of the UDHR? Are there translations of the UDHR into non-UN languages? The Universal Declaration of Human Rights was adopted by General Assembly resolution 217 A (III) of 10 December 1948 (A/PV.183), by a vote of 48-0-8. The drafting of the Declaration took place in various bodies, from 1946 to 1948. The declaration was adopted at the Palais Chaillot in Paris, where the third session of the General Assembly was held. The UN Libraries have digitized the documents related to the drafting of the declaration. In addition to being available from the website developed for the project, all the documents are available in the Official Document System and through UNBISnet, the Library's catalogue. A scholarly overview of the procedural history, with related materials, is available in the Audiovisual Library of International Law. In addition to being available in the official languages of the United Nations, the Universal Declaration has been translated into many other languages. Over 500 translations are available from the website of the Office of the High Commissioner for Human Rights (OHCHR). The OHCHR Library has a searchable interface that allows refining of results by language, country, and geographic region, entity submitting the translation, and links to the Declaration translations page. To search by a country or a geographic region, select "geographic area" in the "any field" drop down menu in the Advanced Search. The Declaration is also available in two sign languages - English (UK) and Spanish (Caribbean).